The Hungarian Parliament elected her Judge of the Constitutional Court in June 2011, with the effect from 1st September. She graduated from the Faculty of Law of József Attila University in Szeged in 1978. She worked as a barrister from 1984 to 1993. On 1st March 1994 she was appointed to Judge to the Court of the 2nd and 3rd district of Budapest, for criminal cases. She was dealing with all kind of cases in the sphere of competence of the Court, including contraventions. 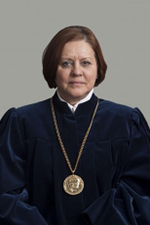 From 1st July 2002 she was appointed Judge to the Criminal College of the Court of Budapest. Her task was to judge over the review of coercive measures imposed before the indictment, also over immigration issues, and review of contraventions. She acted as a single judge in issues of pre-trial detentions that were longer than one year. From April 2007 she was member judge of the Court of Appeal of Budapest, since March 2008 she has been the president of the Criminal Council of the Court of Appeal of Budapest. Since 1993 she has been university professor at the Faculty of Human Sciences of Pázmány Péter Catholic University, she has been a lecturer also at the Department of Criminal Law of the Faculty of Law of the same university, since 2006 she has been Master professor.